For the second week of our Solar Myth Busters series, we're covering a myth that is surely the number one reason people miss out on solar's lucrative incentive programs—the illusive solar price drop! Read on to find out why waiting isn't always the best option when it comes to solar, and be sure to to subscribe to our blog and check back frequently to stay up to date on our latest myths busted. Prices for solar keep getting cheaper, so I should just wait and pay less down the road. While it’s true that solar panels prices are getting cheaper, there are actually several other factors that have a much larger and immediate impact on the cost of going solar. Currently, there are state and federal tax incentives that can offset more than 30% of a solar purchase. The 30% federal solar investment tax credit (ITC) and the $1,000 state of Arizona tax credit are the most beneficial incentives to take advantage of when you go solar, but they're not going to last forever. This year is the last chance to claim the 30% federal solar investment tax credit (ITC) before it starts decreasing in 2020, so if you're waiting to save five or ten percent on panel pricing, you could be letting a 30% tax incentive pass you by. The current 30% rate is in place through the end of 2019, so this is the last year to reap the maximum return from this lucrative incentive program. In 2020, the ITC reduces to 26% and then drops again to 22% in 2021. From 2022 onward, the residential ITC no longer exists, but the commercial ITC will remain at 10%. While next year's 26% rate still sounds pretty good on paper, it actually has a sizable impact on the payback period, extending it by a factor of several years in some estimates. 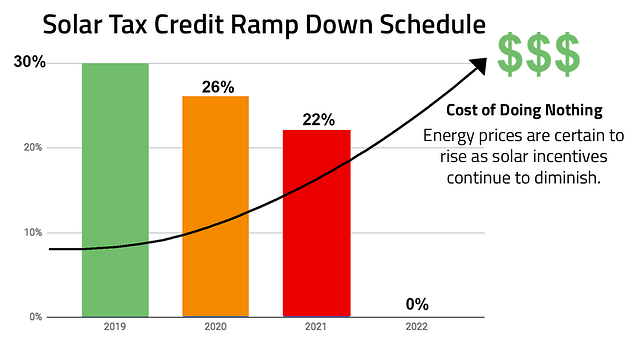 When it drops to 22% in 2021 the payback period will extend yet again. So, if you're inclined to turn Arizona's most abundant natural resource into immediate energy savings, we strongly recommend grabbing the 30% rate before while it's still here. We're barely into 2019, so it's natural to think you still have plenty of time to make the switch and possibly wait for prices to decrease over the year, but going solar involves many steps as well as coordination with outside entities for permitting and commissioning. Plus, installers like Sun Valley Solar Solutions are already seeing tighter installation schedules than normal as people rush to make the 30% deadline. If you're thinking about waiting for solar prices to drop even more, you'll be missing out on lucrative tax benefits that will have a more immediate impact on the ROI of your solar investment. With the 30% ITC coming to an end, 2019 is surely the most important year for solar in more than a decade. Contact one of our qualified solar integrators to start your solar project today!